“Allie” is a wonderful book written about the perils and triumphs of an elephant that tells her life story of what it is like to live with peanut allergies. The illustrations are exceptional as the artist, Maggie Nichols, is a middle school student. Conceived and written by Nicole Smith, “Allie” is geared towards educating the pre-school to 1st grade level about peanut allergies, allergic responses and how to say “No, thank you.” to foods offered by other children and adults alike. 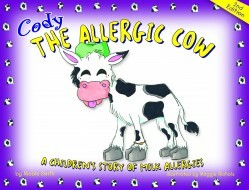 “Cody” helps children learn about milk allergies and how to recognize an allergic reaction. Beautiful illustrations and a simple text make this book a must-have for your child, friends, grandparents and classrooms. This is the second book by Nicole Smith, and illustrated by Maggie Nichols. 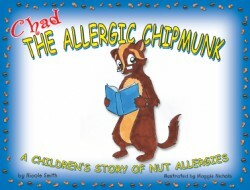 “Chad the Allergic Chipmunk” helps children and adults learn about tree nut allergies and how to recognize an allergic reaction. “Chad” explains nut allergies in a way that parents, teachers, and children themselves can talk about allergies and understand them better. Written by the author of “Allie the Allergic Elephant” and “Cody the Allergic Cow,” “Chad” is her next book discussing severe food allergies. 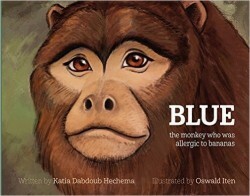 This charming story about a little monkey named BLUE, tells the tale of his food allergy and how he learns to live with it. however the content may be too advanced for young children. I feel it’s better suited for ages 7-10. 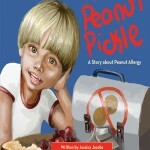 It is an engaging story of an anaphylactic reaction to peanut butter in school. This is a great book to explain (especially to girls) that one small bite of a peanut can be lethal to a child with peanut allergies. The illustrations are great, and the story is wonderful for little princesses! Aaron has terrible allergies to his dog and has to find an animal suited for him. This is a sweet story geared toward ages 4-8 about pet allergies. The Peanut Pickle will help children learn how to tell others about a food allergy and explain that they need a safe environment. It will teach them how to deal with difficult and awkward situations that inevitably arise when a child has a life-threatening food allergy. It also includes a guide for parents to help their children with food allergies. “Abby” is one of the few children’s books on milk allergies, and it has a nice message all in rhyme. It’s very reminiscent of the Dr. Seuss tale, “Green Eggs and Ham.” The illustrations aren’t great, but the book will get the point across to milk allergic children. This is a funny book that isn’t for the overly sensitive about their eczema and dermatitis! My son thought it was hysterical. 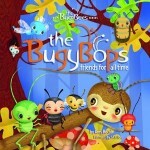 An adorable rhyming book for children. Eight friends with different food allergies plus a quiz at the end to enhance the information about food allergies. From washing hands to reading labels, BugyBops show how a few simple steps can help prevent serious allergic reactions to Top 8 foods. Cross-contamination, Epipens, and the physical signs of an allergic reaction are also introduced. Dr. Michael Pistiner and The No Biggie Bunch make food allergy education enjoyable and engaging in this book. Kids and caregivers will find answers to their food allergy safety and management questions, and solutions to their everyday challenges. This is a great book especially for gaining tips to help your child become a self-advocate. Teens also will like this book. A memoir that will remind many of you with food allergic children of the challenges and triumphs of living with food allergies. This book is especially good if your child has been newly diagnosed. Also, if you enjoy statistics and research, both abound in the book. Our experience has been different regarding schools and camps than what Dr. Sicherer suggests, and since he is a doctor and not a food allergic parent – take that into consideration. If you haven’t yet read the Love and Logic series of parenting books, you might want to read those books prior to this one. Yet, this is a good book explaining difficult health situations with children. It does focus more on cystic fibrosis and other diseases than on food allergies. Yet, the overall tone of the book can be used in parenting a severely food allergic child. A great book for the newly diagnosed, and written by the mother of two food allergic children. The author also has a PhD in medical microbiology and is a Registered Dietician. If we lived closer to Dr. Bock and his practice, I’d be getting an appointment! This book offers some amazing possibilities for really curing allergies and other behavior issues. 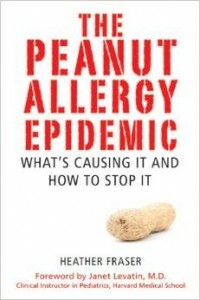 This book is the most well researched one I’ve read about the peanut allergy epidemic. While it reads more like a dissertation, the supporting research is voluminous and necessary. The chapters on the history of vaccination and the impact on the current epidemic of peanut allergies is shocking! 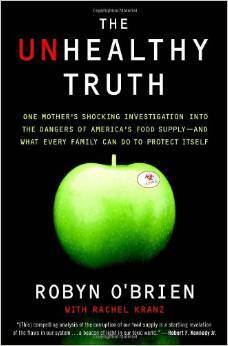 This book goes beyond food allergies into looking at the entire food supply and what’s causing our children to be sick. Great read! 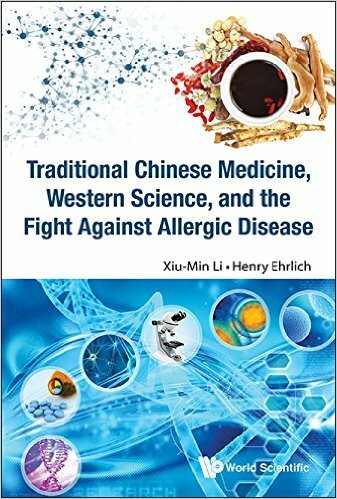 If you’re thinking about visiting Dr. Li and participating in her research, this is the book for you! This is the follow up to the first book, with detailed stories about where Dr. Li’s TCM has changed the lives of her patients. All of the recipes in the book are free of the top 8 allergens: dairy, wheat, eggs, soy, peanut, tree nuts, fish and shellfish plus refined sugars. Amazing! This book is in conjunction with Alisa Fleming’s website: GoDairyFree.org which is a great resource for the dairy allergic. The book has recipes, lifestyle suggestions and great info for all who need to avoid dairy. 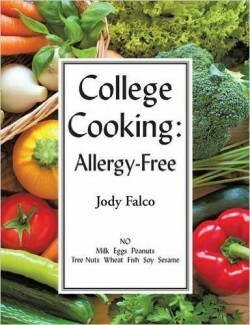 This cookbook is written by a Mom of a food allergic child and the recipes are free of Milk, Eggs, Wheat, Soy, Peanuts, Tree Nuts, Fish and Shellfish. She does use oat flour in most of the recipes, so for those of you with celiac disease, this cookbook is probably not for you! The Divvies Bakery Cookbook: No Nuts. No Eggs. No Dairy. Just Delicious! The Divvies products are amazing, and now Lori comes out with a great cookbook! I only hope that my recipes can produce the beautiful results that she creates! An easy-to-use, comprehensive cookbook for those who must eliminate dairy products, eggs, and nuts from their diet. With an emphasis on fast and easy cooking, the book includes recipes for baked goods, soups and salads, main dishes, side dishes, and breakfast foods all based almost entirely on normal, easy-to-find ingredients. Hundreds of tasty, nutritious recipes and menus without wheat or gluten. Over 325 Natural Food recipes Free of All Common Food Allergens: wheat-free, milk-free, egg-free, corn-free, sugar-free, yeast-free. Written by a mother of a food allergic child. The book includes recipes for salads, main courses and the most important dessert! An easy-to-use restricted diet cookbook written by two English moms, with 100+delicious recipes that everyone in your family can enjoy whether it’s dairy &/or wheat &/or soya and nuts that individual members have to avoid. Dealing with any food allergy is a challenge, especially when you find yourself coping with more than one of the common food allergens: gluten, wheat, dairy, or eggs, as well as soy, corn, tree nuts, or peanuts. Laurie has great use of alternative flours and ingredients. 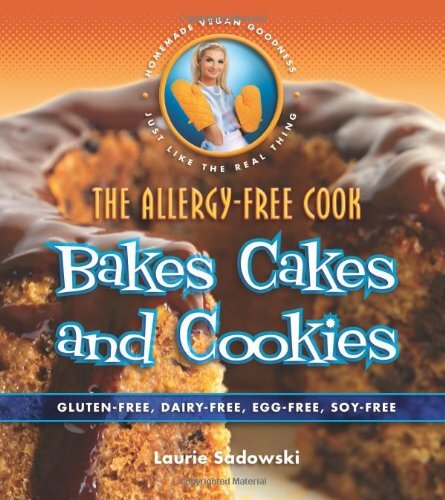 A follow-up and companion to The Allergy-Free Cook Bakes Bread, this book is designed for anyone who needs to avoid gluten, dairy products, and other common food allergens but doesn’t want to feel deprived.